Nonprofits are masters at doing more with less. When you’re used to doing it all yourself it’s hard to pinpoint the moment when the marketing and communications needs of your organization have grown beyond the ability of your hard-working staff to handle them. Maybe you’re thinking you need more expertise – is the intern REALLY maximizing our return on social media? – but can’t afford to bring another skilled professional onto the payroll. Or you’re doing just fine most of the time, but that ambitious new project is going to strain your resources to the breaking point. You know it could also transform the way audiences see you, bring in new support and generate media buzz – if it’s done right. 1. You keep hearing, “More people should know about this!”There’s nothing more frustrating than presenting great work to an empty room. Communications firms get your existing programming the attention it deserves by opening the media and the public’s eyes to great stories that have been right in front of their noses all along. 2. Your programming is expanding — and you want your audience to grow along with it. Ready to launch the next phase of your organization’s development — particularly one that’s meant to reach an entirely new audience? Through community outreach and targeted marketing campaigns, communications firms can craft relevant stories and make meaningful connections. 3. You need a fresh pair of eyes.You’ve heard your organization’s message so many times you could recite it in your sleep – but are you sure your audience is hearing it? A communications firm that has in-depth experience working with a variety of organizations can bring a fresh perspective to the way you talk about yourself – and give you new insights on how to extend that across all of your communications efforts to drive real, impactful results. 4. You’re planning a big special event. Every organization needs to go outside their comfort zone sometimes. But when you’re planning a big event – breaking ground on a new facility, launching an ambitious new project – it’s not the right time to be learning on the job. A communications firm can make sure a special event and its messaging is managed every step of the way so that audiences know how it relates to your mission, and the cameras are there at exactly the right moments. 5. You feel totally overwhelmed by social media. How are you supposed to keep your finger on the pulse of what’s hot in social media when you’ve got a company to run? Engagement is the name of the game, and having folks dedicated to keeping up with what’s new and what works on Facebook, Twitter, Instagram and Pinterest means you can focus on the big picture. Ready to take the leap? 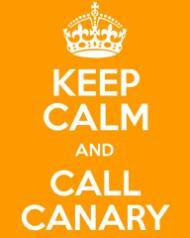 Get in touch: 215-690-4065 or info [at] canarypromo [dot] com.